The Tangansky Protected Command Point, now known as Bunker 42, was constructed, 65m, 18 floors deep. Located just over two miles from the Kremlin, and most importantly, adjoining the Moscow Metro. This way it could be built without the Americans finding out, the huge amount of material excavated just part of the even larger underground railway expansion that was going on at the same time. The Metro also provided for safe and secret access to the massive 70,000 sq ft complex. Up to 3,000 people could live and work there for 90 days without assistance from the outside world, thanks to stores of food and medicine, an air recycling system and diesel generators. The four main double deck tunnels of the complex were shielded with a metre of concrete and four inches of steel. 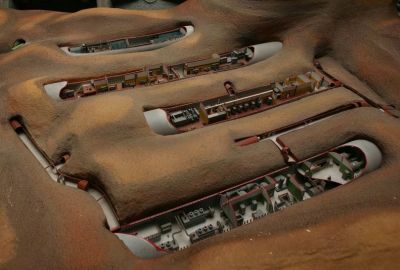 A prototype of the bunker design was tested in Kazakhstan and after various domestic animals inside survived a large nearby nuclear blast, the design was approved for Moscow. At ground level the site is covered by a ubiquitous building that was once a school. There is a lift down to the complex but the walk is in fact quite easy – 288 steps. Getting up can be hard work if the elevator is busy. Decommissioned in 1995 and sold off at auction, this ex-military communications and command post is now a museum dedicated to the Cold War. 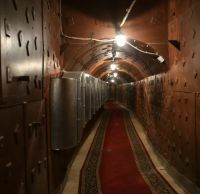 Complete with KGB rooms (now rehearsal space for heavy metal bands), raid sirens, and kilometres of tunnels, this is the real experience. Guides (straight out of central casting with their heavily accentuated English) play the role of KGB officers and the exhibits are all very hands-on. Not recommended for claustrophobics, but definitely for the curious and historically inquisitive. 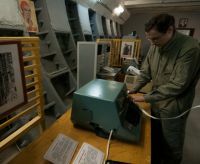 The bunker is also available to hire for functions, be they conferences or team-building role play games with lasers and paintballing and so on. As part of the museum, there is a pair of missile silo control panels, imported from a real Soviet ICBM site. You can sit in a command chair and simulate a launch. The controls, switches, TV screens and keyboard complexes are all very 1950s. At the present time there is plenty of work going on to further open up a fascinating relic of a war that (thankfully) never took place. It is not the best place to test Russian food, and perhaps that is deliberate. Those who were incarcerated here (950 were locked in for 10 days in October 1962 when Kennedy stood up to Khrushchev) had to make do with the stored provisions. We will never know the quality. Water is no problem. It comes from artesian wells. The tour itself is about half a mile long and for the most part on the flat. All the time the Metro trains rumble by, a strange experience. Had an attack actually happened what would have been the reaction of those in this living tomb? Perhaps it might be an idea for Bunker 42 to show Stanley Kramer’s fine award winning 1959 film “On the Beach” starring Gregory Peck and Ava Gardener. The book is by Neville Shute. It is a sad tale of what might have happened.